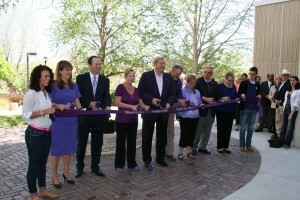 Key alums, philanthropists and student leaders join Dean Mercer for the ribbon cutting ceremony. About 75 philanthropists, faculty and friends gathered outside of Bluemont Hall on April 25th for the official dedication of Bluemont Circle. Inspired by K-State’s sesquicentennial celebration, Bluemont Circle is lined with 150 pavers, many immortalized with the names of people who helped build the college – from the inside out. The focal point is a magnificent four-foot bronze statue that is an international symbol for education: a boy sitting atop a globe wearing a graduation cap reading a book. A special thank-you to longtime education advocates Lee and Barbara Harris who donated the funds for the statue.